Examples of dealers gouging on fees so bad you won't believe your eyes! We have been warning consumers for years about excessive car dealer fees and how to avoid them. Just a few months ago we issued an alert in one of our blog posts titled CarBuyingTips.com Warns Car Dealers are Double Charging New Car Fees where we warned you how dealers are double charging you for some state fees. But now we have discovered other new car dealer fees at a local Toyota dealership that are so steep you might want to call it price gouging. The examples shown here will make your jaw drop. The image below shows the Monroney window sticker of a Toyota Corolla S Plus. You can see the dealer has added their own sticker, subtly taped to the right of it to blend in, listing over $5,000 in additional fees charged by the dealer. You can see the dealer used similar fonts and made it look as though it was part of the official MSRP window sticker that Toyota puts on the window. As you can see at the bottom of the official part of the window sticker, the MSRP is $21,169. But just take a look at the sticker that the Toyota dealer added on the right side of the Monroney sticker. The dealer wants you to pay $5,369 in excessive fees, jacking the total selling price of this car all the way up to $26,538. You've been legally car jacked by the dealer! Apparently the dealer was unhappy with the slim profit margins on one of Toyota's lowest margin vehicles, so they decided to add their own profit margin to the car to make up for it. How much should this Toyota Corolla S Plus sell for? When you check on TrueCar, their pricing graph shows you the average price paid for a Corolla S Plus was $19,944, which is within a few hundred dollars of our spreadsheet estimate. The TrueCar price curve does also show that some people paid less than the TrueCar average price, and probably closer to our spreadsheet estimate selling price for this new car. 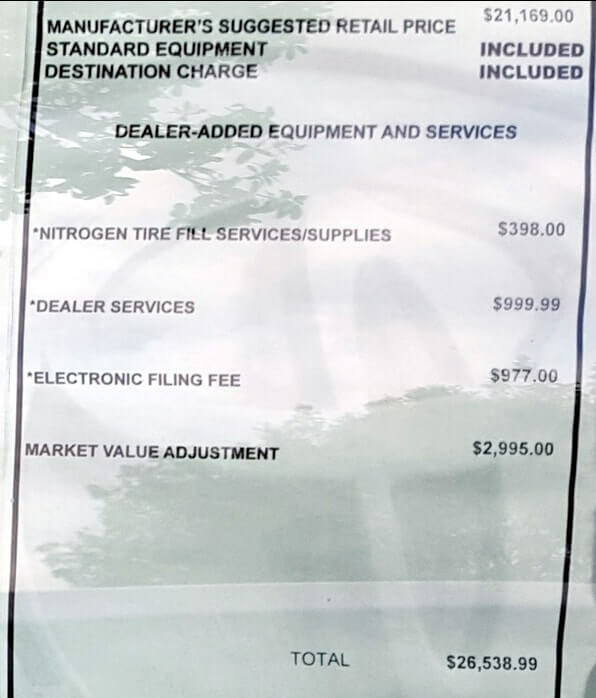 The picture at the top of the page shows you a close-up view of the additional fees sticker that the dealer added onto the window. The design of the dealer's sticker is so similar to the official sticker, that one must wonder if they designed it this way to trick the buyer into thinking it is an official sticker from the factory itemizing real costs. 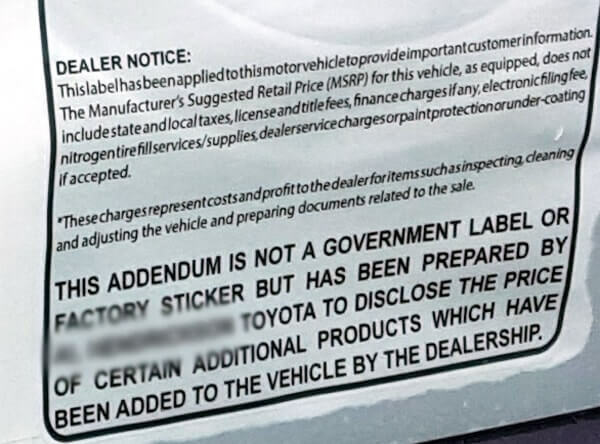 In fairness to the dealer, they do mention in bold letters at the bottom of their sticker that it is not a factory sticker, and it is not a government sticker and that it was made by the dealer to allow them to charge you for extra fees related to this new car. But come on, don't kid yourself, no one ever reads that. Just look at the fine print all over the window stickers and it's a numbing array of text to parse. The buyers are usually not presented with the sticker; hence they are unaware that the dealer stuck in their own icing on the MSRP cake. So buyers are just shown that final $26,538, and they accept it because they think that it's the window sticker price, but really isn't the sticker price, it's the dealer's whimsical price. The wool gets pulled over the buyer's eyes, and they have no idea they were in a position to confront the dealer to remove the excessive fees, which look like the type of price gouging you'd expect after a hurricane strikes. Ironic don't you think; that a fee related to inflating tires is over inflated? The nitrogen tire inflation gimmick has got to be the biggest scam ever pulled on the American Public. Many dealers and repair shops charge $50 to $100 extra for nitrogen inflation which is supposed to be better for our tires than regular air, because the tire inflation will be more stable across temperature, and the larger molecules mean the nitrogen will not leak out of the tires as quickly as air does. The problem with nitrogen is what happens when it does finally leak out a bit and you need to top off your tire? Do you use regular air for this? Do you go to a tire store and pay massive amounts of money to top off your nitrogen tires? If you bring your car in to have your tires rotated and the shop does not have nitrogen, then you just lost all the nitrogen you paid for in your tires. Now along comes the dealer who wants to charge you about $400 for nitrogen! Are they nuts? Who would knowingly and willingly submit to this fee which amounts to nothing short of oppression? Costco charges you nothing extra when you buy new tires from them; they fill your tires with nitrogen for you. But wait, it gets much better. 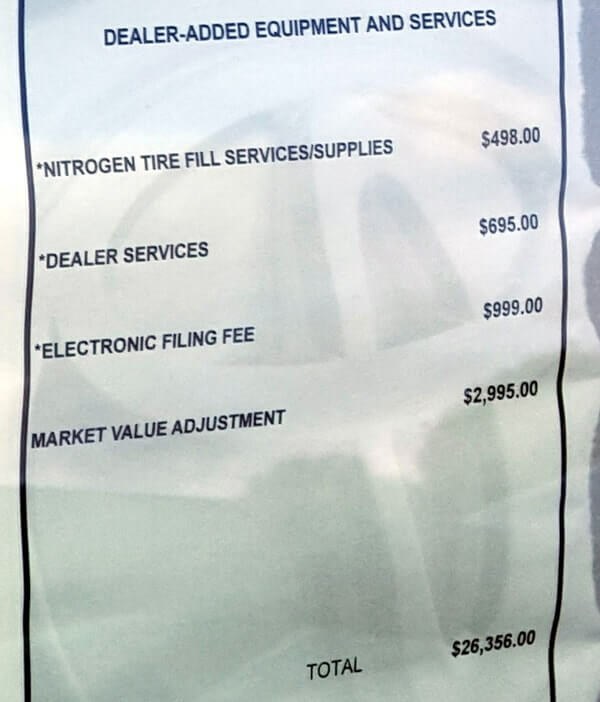 Check out this picture below, where on one of the cars on the Toyota car dealer lot, they upped the gouging fee they are charging you for Nitrogen service all the way up to $498! Remember the first example way back at the top was only $398. At $498, that is 5 times the cost that other shops charge for nitrogen tire inflation. Why does this dealer charge $100 nitrogen fee more for the same car? This is the highest amount I've seen for dealer fees on a car this low in price. Who knows what these services are, but you can bet they are not worth a thousand bucks. 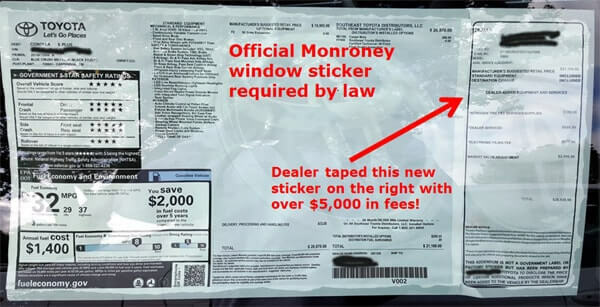 If the dealer tries to convince you it covers their cost of getting the car ready for sale to you, just remind them that the official window sticker says this near the bottom: "Manufacturer's suggested retail price includes manufacturer's recommended pre-delivery service." This means the dealer should not be charging you for any pre-delivery service. They want you to pay $977 for an electronic filing fee? That's almost $1,000 just to move a few electrons from Point A to Point B? I don't know who is more insane, the Toyota dealer for thinking they can charge this amount, or the fool who actually pays it. This is another massive scam that many dealers pull on unsuspecting car buying victims. Most dealers try to charge $100 for this electronic filing fee, but it usually costs only about $20, handled automatically by third party software vendors who tap into the dealer's sales and CRM back end systems. My brother in law talked a Ford dealer into dropping their electronic filing fee from $100 down to $50 a few months ago. Even if the dealer tries to claim this fee includes vehicle registration, it's still gouging. Here in our state of Florida initial registration fees for new cars is $200 if you don't have a license plate to transfer from your old car to the new car. If you have a plate to transfer then your registration fees may be significantly less. This is the worst fee that car dealers charge, because it is all icing on the cake for them, and gives you nothing but oppression in return. Traditionally, when a car model is selling like hot cakes, as is usually the case with Corvettes, they often sell for a few thousand dollars over sticker price. The dealers used to stick on another sticker near the window sticker stating phrases like Additional Dealer Markup (ADM), or some other cryptic acronym. In this case, the Toyota dealer is doing the same thing, just for no reason adding another three thousand on to the price of the car on a Corolla of all cars. Again, there is no justification at all, especially since I saw a few dozen of these cars on their lot the day I visited them. The only time you get to legitimately charge $3,000 over sticker price is when you have none on the lot and everyone is asking for one. But until then, have them remove this toxic waste. Remember also that this dealer wants you to pay well north of $5,000 over sticker price for this car, but when you try to sell your car years later, all the buyers are using Kelly Blue Book and NADA guides, which lists depreciation based off the common selling price of the car which was closer to $20,000. Your buyers later on could care less how much more than sticker you paid for the car, they only know the used car pricing guides are telling them your Toyota Corolla is worth a lot less based on an original manufacturer's MSRP sticker price that was way less then you paid for the car. It never benefits you to pay the dealer more for a car, because you'll never get that money back. Don't fall into their trap and don't haggle the selling price down from their over inflated $26,538 selling price, that is what they are counting on. Even if they drop the price $4,000 down to $22,538 and make you think you got one heck of a deal, you will still end up paying $3,000 more than you should. Instead confront the car salespeople with your knowledge and offer them what our spreadsheet says you should be paying. You want to be paying $19,574 and you certainly don't want to be paying the $26,538 shown on the dealer's additional pricing sticker. If you just rolled over and submitted to the Toyota dealer's greed, you would have paid $6,964 too much for this car than our buyer's offer spreadsheet tells you to pay. If you cannot convince the dealer to drop these fees back to their proper levels, then you need to walk out. 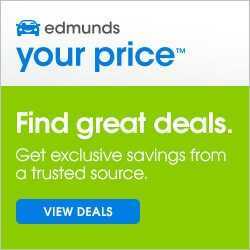 When you use the free car shopping referral services like TrueCar, CarClearanceDeals, or Edmunds they usually pair you up with an internet manager at the dealership who typically won't play these games. They usually have already calculated and agreed on the selling price of the car at a discount, which typically does not have all the excess fees, and you just bring in your certificate to get the discounted price. You still need to carefully review the deal and in the case of this Toyota, you want to make sure the dealer does not tack on any extra fees. The time to review your paperwork is while you are still at the car dealership in the finance office, not when you get home, like too many lazy consumers do. This way you avoid the heartache of knowing you got taken for a ride. Let me warn you they may just let you walk too; many Toyota dealers in the past have proven themselves to be cocky and arrogant. Have you seen a car dealer trying to charge you unbelievable gouging fees? Let us know in the comments below.